One of the cruelest lessons that you have to learn early on as a writer is that you will have to kill your darlings. I don’t mean your darling characters (though sometimes you have to kill them, too), I mean those brilliant phrases, scenes, entire chapters that meant so much to you and sometimes felt like the best thing you’ve ever written. 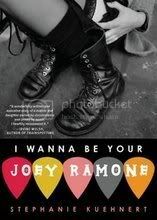 Many darlings were killed in the process of revising I WANNA BE YOUR JOEY RAMONE, which went through eight—count ‘em, eight!—drafts before it reached the bookstore shelves. The town of Carlisle and the people in it are entirely fictional, so I wrote a lot to get to know them. I wrote scenes that told important back story about my minor characters and I wrote entire chapters from the perspectives of Molly, Michael, and Tom. I kept writing so I could see my entire world three-dimensionally and I also kept writing just because I loved the place and the people, so I wanted to keep spending time with them. As result, the first draft of the book (which was called “The Black Notebooks” at the time) was 151,167 words and 484 manuscript pages long. In comparison, the final version before copyedits was 92,665 words and 312 ms pages and I’m sure we cut out another thousand words or so in copyedits. Obviously that first draft was way, way, way too long. Of the three years I spent working on IWBYJR, one year of that was spent revising and killing darlings. 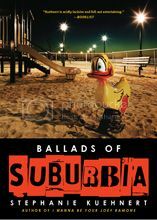 When MTV Books took the project on, I was up to draft number seven and the book was called “All Roads Lead to Rock ‘n’ Roll.” It was 112,589 words and 365 ms pages long. My editor made it clear that I would be cutting all points of view besides Emily and Louisa’s (only Molly and Michael remained at this point) and that there were parts of Emily’s story, particularly around her music career that I needed to heighten, which meant adding approximately a chapter and a half (the chapter I added was “Songs My Mother Never Taught Me,” another title I pondered for the book). Oh, and even though she wanted me to add stuff, she really didn’t want the manuscript to come in over 90,000 words. This meant I cut the stuff from Michael and Molly that Louisa or Emily wouldn’t know or tell. Some stuff was probably excessive, but I had to cut one scene that both my editor and I loved about the early years of Molly and Louisa’s friendship. I also cut one Emily scene I loved. The only comfort I took while doing this was that these scenes wouldn’t be lost forever. I knew that after the book came out, I could create an outtakes section on my website and I put that up last night! There are seven “deleted scenes”/alternate versions up there now for you to check out. However, I strongly advise that you only read these if you’ve already read the book. For one, there are spoilers galore (like I share a story called “Fairytale,” which was the story I first wrote about Louisa and it tells her big secret. It was chapter two in the first draft of the book, but cut almost immediately because it spills too much about her too soon). And then, I don’t want you to judge my writing from this. All this stuff is rough, some of it really rough. I’m at my best when I rewrite. My early drafts can be ugly. I put these sections up not only to share more of the IWBYJR world with you, but also to give you an insight into my process, so please think of them as “demos,” not the polished final song that I really want you to hear (ie. the finished book). That said, I am really interested to hear your thoughts on these parts as you read them, so please come back here and leave comments if you have them. (It might take you some time to read, ‘cause there are 7 sections and they range from about 7 pages in length to 20 pages.) I’m interested to see if any of these insights into certain people’s back story change or influence your feelings about characters like Molly, Michael, and Louisa. Did you enjoy the extra Emily scenes? Did they show you anything more about her? How do you feel about Johnny after reading his story? Would you have been mad at Emily if she’d listened to him and let it influence her? And how do you feel about the idea of Regan cheating on Tom? Is it true to her character or do you just want them to have their Happily Ever After with little conflict? It was strange to go back through this again. I cringed at some of my writing of course (seriously, to the new writers out there, sitting on something for even a few months while you work on something else is so helpful and really can help your writing grow by leaps and bounds! ), but I also got very nostalgic for my characters. People often ask me if there will be a sequel to the book and I always answer, “Maybe if Emily or Louisa get demanding, but right now even though I know their past, I don’t know their future beyond the end of IWBYJR.” However this past weekend at the library event that I did, the librarian phrased it differently, asking me if I ever thought of telling a story from the perspective of one of the other characters in IWBYJR. Michael was the person who she really wanted to hear from. Honestly, the sections I wrote from Michael’s POV were the hardest, so I’m not sure if I could write a whole book about him. I’d lean toward Regan or maybe Marissa. Or maybe both of them. But again, I’m curious as to what other people are thinking. If I were to revisit the characters from Carlisle, who would you like me to focus on? Continuing with Emily and/or Louisa or is there another character you are dying to know more about. Now please note that I don’t see myself doing this in the near future, but who knows. I’m not ruling it out. Women Who Rock Wednesday: Rebecca Woolf! Last Day at the Office and Rock Star Sundays! Women Who Rock Wednesday: Carrie Borzillo-Vrenna!